Free bike lockers (for Clive), originally uploaded by burgerjesus. This is from my mate 'Burgerjesus' on Flickr. 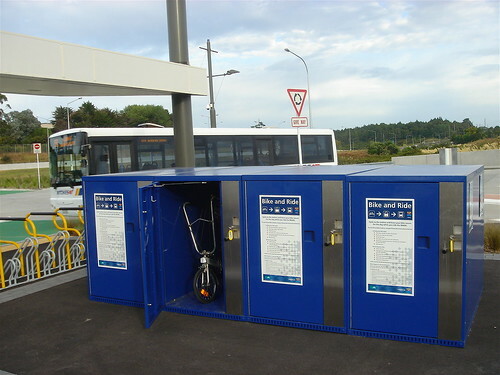 New bike lockers for a new 2-way busway. Insert a $2 NZD coin and it is refunded when you pick up the bike. The box has hooks inside for helmets and raincoats etc. Unbelievably, the powers that be have built a busway (2-way bus motorway) beside the existing overcrowded motorway that takes all traffic from the North Shore over the harbour bridge to downtown Auckland. Something was needed as we have no rail at all on this side of the city and the northern half of Auckland is expanding rapidly, but I feel a light rail system would have been much more appropriate. The last thing we need is more roads and more vehicles. At least they have made a good job of constructing it.